She was born and raised in Spain, but Berta Moreno fell in love with American jazz and wanted to be part of it. Suffice it to say, her wish came true. 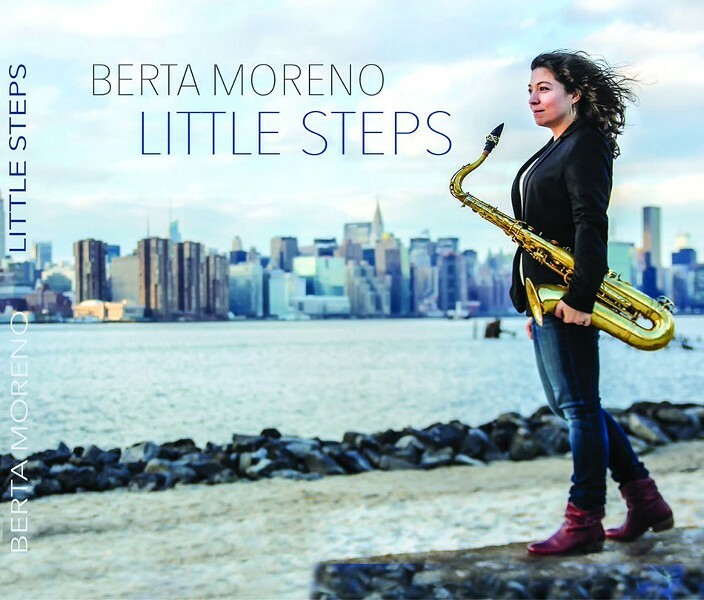 Moreno's debut album, "Little Steps," not only showcases her prowess as an improviser on the saxophone, it also highlights her formidable talent as a composer. Moreno plays tenor on the album, holding her own against top veteran players Steve Wilson on alto and soprano and Troy Roberts on tenor and soprano. Her quintet is rounded out by the always excellent Manuel Valera on piano; David Hardy on drums; and bassist Maksim Perepelica. Moreno is known in Europe, but is just getting a foothold in the United States. Most startling among her talents is her compositional skill. While certainly rooted in the great jazz of the 1950's, her tunes are intricate and highly original. She's capable of beautiful ballads, like "Lullaby for Rafi," and up-tempo romps, like "Mind the Gap." The album's title, "Little Steps," seems an obvious declaration of just getting started (as opposed to the mature grandeur of John Coltrane's "Giant Steps"), but if this notable album is a start, Moreno's journey will be one worth following.